Why is Push Video superior than Email/ SMS notification? 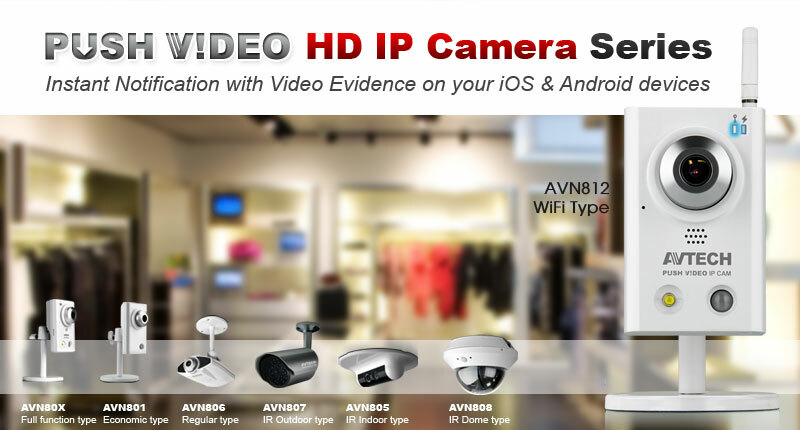 Within a few clicks, EagleEyes will find the camera, finish IP configuration, forward ports, register a free AVTECH DDNS all automatically. Once users want to change any configuration, they won't have to find a PC but to use smartphone to make it. The camera instantly sends you a Push Notification which will playback a short recording of what it captured when detecting events. Each Push Video playback will be saved inside your smartphone as evidence. You can also store any clip you want for backup. Combining external alarm devices with Push Video, you can offer many more unique solutions on your own. Whether you are at home or not, you will know who rings the bell at door and decide if you’d like to talk to the visitors (through 2-way audio) or unlock the door by clicking alarm-output icon on EagleEyes. Managers who install Push Video IP cameras in their offices can get notifications every time someone enters. This can also be applied in places such as warehouse, which the person in charge needs to control the access. When the smoke detector activates, you can have the siren go off to alert people to a fire. At the same time, the home owner will get the Push Video within 5 seconds and take immediate action. AVH306~Easiest Network Video Recorder Ever!